Do you want to create better engagement with your fans and followers? Wondering how your business can come across as more human? Engaging on social media with authenticity helps you turn online connections into customers who feel like they know you. In this article, you’ll discover four ways to humanize your engagement on social media. 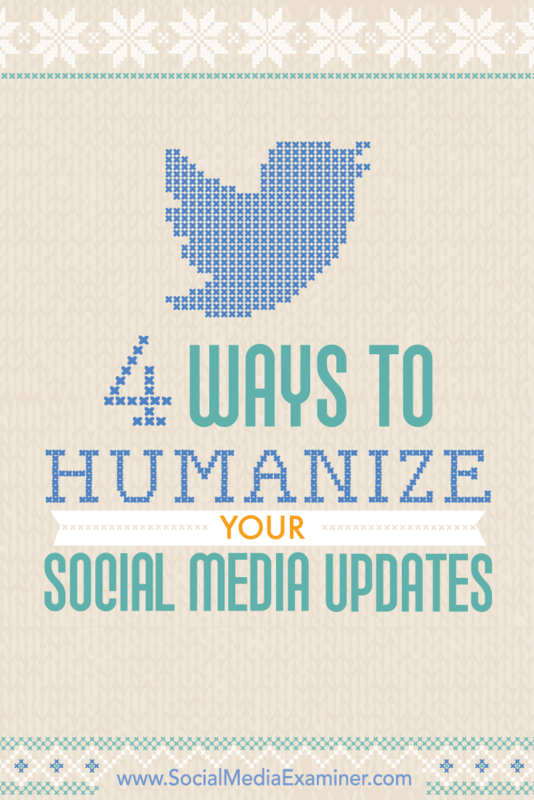 Discover four ways to humanize your social media updates. Why Humanize Social Media Content? Setting up social media accounts and gathering faceless followers who never interact with your brand isn’t enough in today’s competitive marketplace. What you really need are followers that engage with your brand, form emotional connections, and become an audience of loyal customers. Unfortunately, many businesses treat their social media accounts more like advertising channels than vehicles to create lasting and honest relationships with customers. In response, people have learned to tune out promotional messages and accounts that talk only about themselves and focus on the features of their products, not the needs of their customers. If this describes your company, your messages may not be reaching your ideal audience. If you treat your followers like friends, it can make all the difference when it comes to your social media strategy. Showing off your silly or humorous side is one way to connect with your audience. Pause for a second and think about your own personal social media accounts. Do you interact with people who constantly self-promote or post run-of-the-mill status updates? The answer is probably no. You likely interact with people who are real. People who emotionally uplift you, make you laugh, or have legitimate questions or recommendations you feel you can be a part of. The same approach should be taken in business social media marketing. Corporate-speak and lifeless posts can make a company come across as boring and unfeeling. Thankfully, what’s acceptable for a business voice has changed a lot over the years. While old rules forbid contractions, first-person, and slang, the new tone of business language is very different. Now you have the freedom to talk in a much more personal and friendly voice. Try creating posts and tweets that speak to your audience in a conversational voice. You’ll likely find it’s easier for people to converse with you. Bon Appétit, an over 50-year-old gourmet food publication, does a great job injecting just enough personality into their posts. 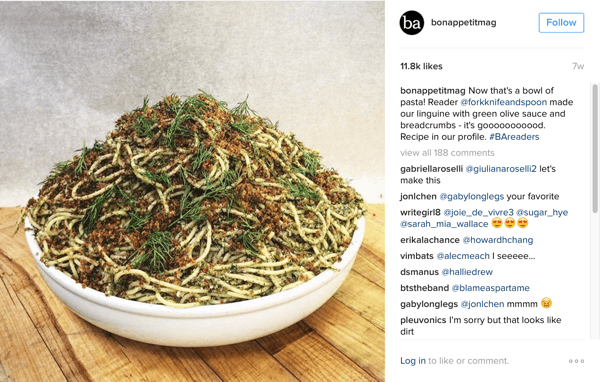 Bon Appétit uses a clever, conversational style in social media posts. Even insurance companies (traditionally not the most fun-loving and carefree type of business) are learning that a little personality goes a long way. Check out the GEICO Gecko’s account, the mascot of the GEICO insurance company. The account, which boasts over 20,000 followers, features quirky drawings and quips, while salesy and promotional posts are noticeably absent. 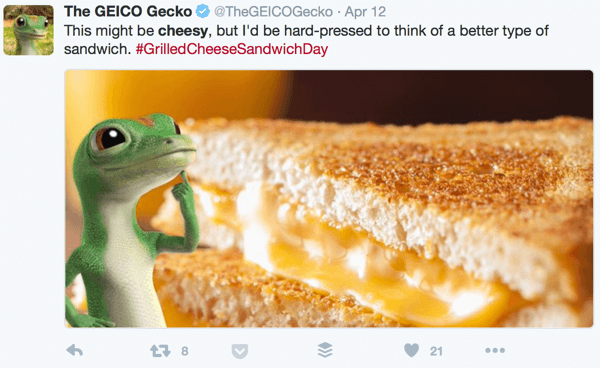 GEICO’s Gecko follows trends and gives them a personal touch. Talk like a real person and don’t shy away from humor, emojis, and a little informality when it comes to punctuation and grammar. Try tagging along on special days and trending hashtags. Find a way to inject your company (like the image of the GEICO Gecko in the above picture). As long as you have clear standards for what’s appropriate to post on social media, you shouldn’t have any problem using a conversational tone, and your audience will appreciate the personal touch. When friends or relatives post something monumental on social media (a finished art project, a life event, a huge accomplishment), what do you do? Chances are you share it and take the time to congratulate them and point out to others what a great job they did. Brands that have mastered social media engagement know they can do that with their social media audience as well. Whenever it’s appropriate, point out something that an audience member did particularly well. Highlight your followers’ pictures, posts, and other contributions to show them you care about the messages they put out. You’ll make them feel special and likely turn them into lasting brand advocates. 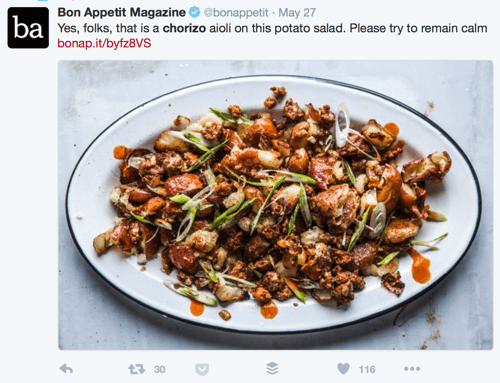 Below, you can see how Bon Appétit featured a reader-made recipe that had originally appeared in their magazine. Bon Appétit highlights readers’ pictures of their own recipes to increase engagement. For brands and companies, highlighting user-generated content not only brings you closer to your audience and strengthens the emotional connection between your business and your customers, but it also offers a non-aggressive way to promote your products and services. To find content from your audience that’s worth sharing, regularly search social media platforms for mentions of your company, your social media handles, or any related hashtags you use. It’s best to pick out posts that demonstrate your products or services in use. If you run a frozen food brand, for example, find pictures of your food in lifestyle settings to repost. If you manage social media for a clothing brand, find pictures of fashionistas wearing your clothes and share those. This is a fantastic way to advertise your brand through your audience. While it may be tempting to ask readers to post pictures of your products or even to pay them, the best and most organic way to encourage user collaboration is to offer services, products, or content that make people want to share without being asked. Make your social media account one that celebrates your fans, not just your own news and accomplishments. Remember: Always give full credit to the original photographer, and make sure to follow any regulations that apply to your business or social media marketing. The problem with looking at social media as a one-way communication channel is that you may miss customer attempts to contact you; whether to solve a product-related problem, leave a complaint, ask a question, or congratulate you on a job well done. The best brands on social media know that you need to listen in addition to talking. Listening to your customers helps you solve problems faster and shows your customers that their voices matter. 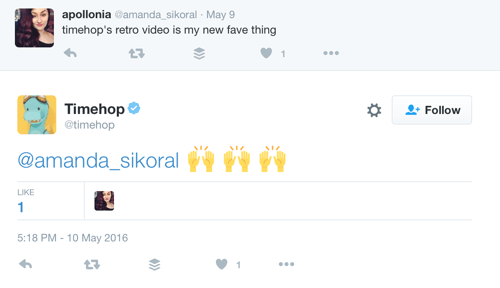 Timehop did an excellent job of having actual conversations with their social media followers when they released a feature that met with mixed reactions. Some people loved it and others weren’t fans, but Timehop took the time to respond to both positive and negative sentiments in a large number of audience comments on the feature. The first example addressed a positive comment and used informal emojis. 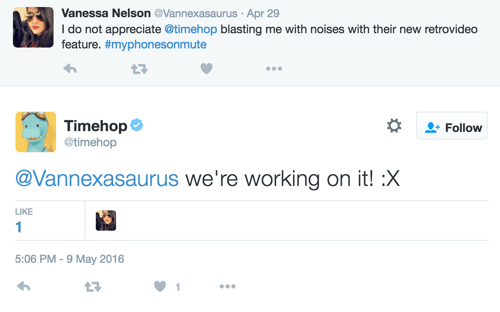 Timehop listens and responds to user comments in a fun, casual tone. In the second example, Timehop responded to a negative comment with an apologetic tone. Timehop answers negative comments gracefully. Take a tip from Timehop and address customer complaints (or praise) in a public space. Be sincere and try to understand and resolve negative issues. Instead of cold, canned public relations answers, match your customers’ voices in your responses, like a real person would. Remember: Don’t shy away from negative comments, do ask questions, and do tailor a personalized message to each person who takes the time to express his or her opinion about you. Social media for business doesn’t always have to be straight-laced and focused on making sales and getting leads. The best way to form a real connection with your audience is to let loose once in a while and show your humorous side. This can work even on professional networks like LinkedIn. 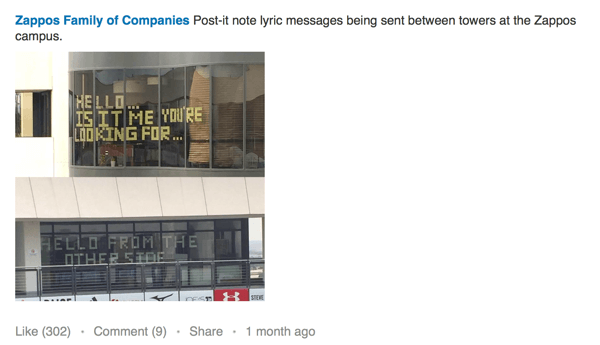 For example, Zappos used a LinkedIn post to shared a cross-campus sticky note competition. Zappos has a sense of humor and it’s evident in their social media posts. Everyone knows that business isn’t always serious, so there’s no reason for company social media accounts to be formal at all times. Try posting something funny that’s not directly related to what you make or do and see how people respond. Making people laugh is one of the simplest ways to make friends, whether you’re talking about real life or the digital world. Using lessons learned from these successful and social media–savvy companies, you should be able to start creating authentic connections with your own audience. Be funny, weird, charming, silly, cheesy, or whatever other attributes best capture the human side of your business. Talk about your customers, talk about cool articles related to your industry, tell a few jokes once in a while. Just remember to keep hard sells to a minimum. Create content that evokes emotion in others and brings them closer to your brand. Ask questions, start conversations, join in conversations. You know, the way you would in real life if you were trying to make friends. Monitor and respond to what your audience is saying on social media. If they’re saying good things, why wouldn’t you want to hear them? If they’re saying bad things, you need to know about it to change their perception. 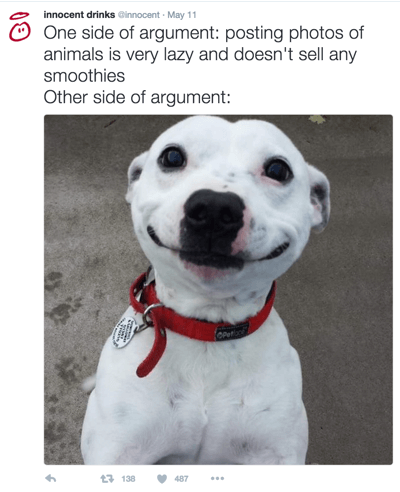 Also, treat every one of your customers like a close friend. If they ask you a question, help them out immediately. If you see something they’d love or think of something that would make them laugh, share it. If they do something amazing, congratulate them and share the post (especially if it’s a post about you or your products and services). If they engage with your content, thank them and engage right back. Go ahead and share good news and cool features about your products, but remember that it’s not all about you. What do you think? Does this inspire you to change how you post on social media? Which tactic will you try first? Share your thoughts in the comments below. 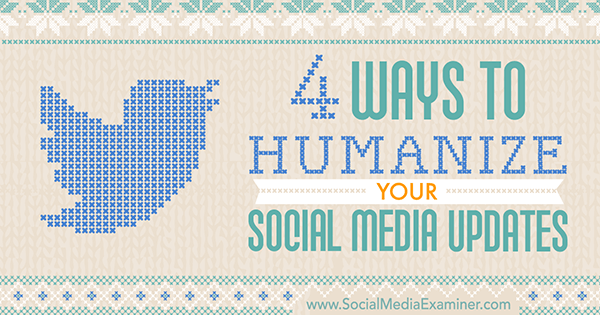 Tips on four ways to humanize your social media engagement. Matt is the co-founder of BKA Content, an online content creation company. Matt is passionate about content marketing, social media marketing, watching NBA basketball, and taking mid-day naps.